Being a stay-at-home dog mom, I don't have the structure of a job. Nothing is set in stone and the dogs and I operate on a flexible schedule. I don't know if it makes it better or worse after a dog dies to be home all the time. All day is a constant reminder. Every nook and cranny of the house holds some memory. And with my every actions centered around the dogs, it becomes difficult to think of nothing else, but them. It took me until 2pm to get out of my robe today. Getting dressed seems like a big feat in between tears. It seems to take a thousand steps to grasp the idea of getting up and putting on clothes. But I did it. The dogs help. They tend to nudge me along. They know when mommy gets dressed, it's time to go outside. I've been struggling lately to go outside with them. I'd rather curl up in a blanket and dream the world away. The dogs have been in mourning as well. Fiona seems to be taking Silver's death much harder than I would have thought. We thought Zappa, being a Momma's Boy, would be having the harder time of the two of them. Fiona practically slept on top of me last night and stays clinging to Mark and I. Zappa acts more like a comforter for us and our tears. I looked into Blaze's eyes today and burst into tears. They are so close to the color of Silver's. My second big step today...writing this down to post. Mission accomplished. Silver on her favorite blanket for the last couple of months of her life. I'm not sure how I'm feeling, but I will try to explain the best I can. It has been 4 days since Silver has been gone. It feels like it has been an eternity. I feel her spirit here and yet I can feel her in the grave. Losing Brut was like a hole blown through my gut. Losing Silver has been like a cold wind blowing through my body. I am feeling and yet I am numb to the loss. So many things I wish to understand, yet it all makes sense. She was not well those last few days. The cancer had taken over. Yet she remained fairly alert and alive. It was still a tough decision. On Silver's last trip outside, Zappa and Fiona came over to their mother and each nosed her. Her last few hours she lead the Howling Chorus in a song. Everyone joined in. I was finally able to capture it on film. And when it came her time, the dogs sang their goodbye to Silver. It was beautiful. It feels like a legacy is over. 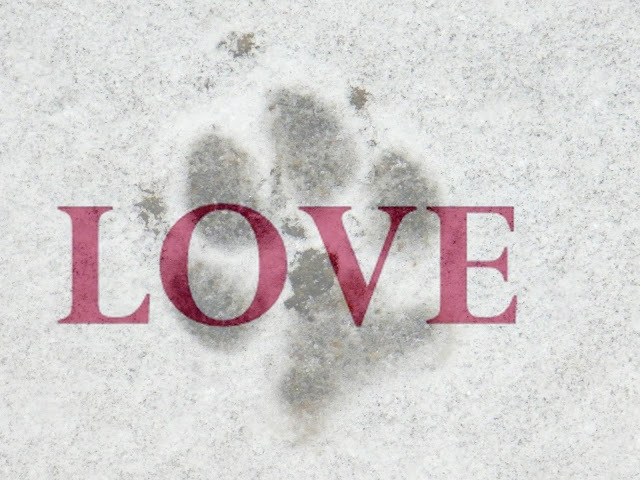 The foundation of which the 24 Paws of Love were built on are gone. It is still hard to comprehend Momma Dog Silver and Daddy Dog Brut are gone. Yet, somehow it still feels like a beginning. 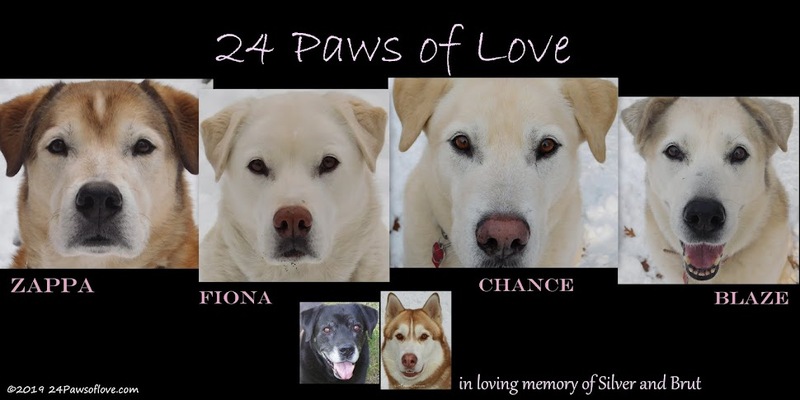 The beginning of something beautiful that will carry their legacy on because we will always be the 24 Paws of Love. Run Free as the wind my Baby Girl. Look out Heaven, there's a new Princess Warrior in town! The roads were snow packed and were suppose to turn icy sometime during the evening. I was in a dilemma about who to walk and how many at a time. My sciatica had been acting up all day and the pain was always less in the evening. Back and forth with my decision, when I finally decided to walk Chance and Blaze, but separately. I could use the reprieve on my back, but it meant two walks. I hadn't completely given up on walking the Back Dog Trio, when Blaze and I started out, but I wasn't sold on the idea either. The evening was misty, foggy and glowed in white between the overcast sky and the snow on the ground. The soft white brightened the walk and gave a warm and cozy feeling. Blaze set a quick pace, just enough for me to keep up with her without totally losing my breath. There was a difference in her tonight, she was relaxed and comfortable and for once we didn't feel at odds with each other. She didn't pull or tug or dart but kept her path forward. With each step I was letting go of the day's worries and letting Blaze lead the way. She walked with confidence without being dominant or demanding as we went this way than that. When we met our turnaround spot, Blaze gently led me forward. She wanted this time with me and our special walk together. So we carried on along the path, just her and I in a quiet, peaceful manner. Enjoying every step that didn't lead to pain radiating down my arm that held the leash to my lower back. This was wonderful! Somewhere half way through I realized the Back Dogs were going to have to wait until tomorrow for their walks. This was too precious to give up. I wish I really had the words to describe it. With Blaze, I have always been intimidated by her wit and smarts. So I have always went into many walks with her trying to outwit and control her. It has only lead to her painfully pulling me every which way, especially in the winter time when she has that Husky energy. The battle of wits leaves me exhausted, frustrated and in severe pain. Tonight I just went with her. Followed her. And she proved her trust and maturity, as well as love. This isn't the first time this has happened. 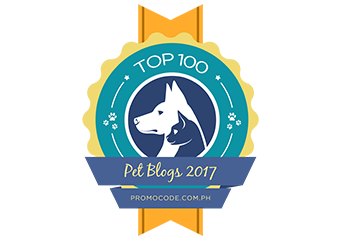 There have been a handful of other times we have walked with her in the lead, but this was the first time that she didn't try to take advantage of it and that was truly heartfelt. Blaze spoke of her trust loud and clear. If I let her, she will guide me. The power of this evening's walk was tested a bit as we got closer to home and Blaze tugged me the opposite direction. She wasn't ready for the walk to end and I obliged her. We walked a little ways downtown, then turned around to come home and that seemed to prove I was listening and heard her. Such simple blessings. Maybe if I don't lead with so much fear when it comes to Blaze, we will have more walks like this. I know we can walk further this way, which I would really love. I was so amazed by the definition she gave me of herself, that I was truly blown away at how much she took care of me on the walk. Peace, understanding and simple unconditional love. All a girl could really want. Especially when it goes both ways. Labels: dog leash training, dog loyalty, dog teaching humans, dog walk training, dog walks, special bonding with dog, special time with dog, spiritual connection, therapy dogs, trust, unconditional love.